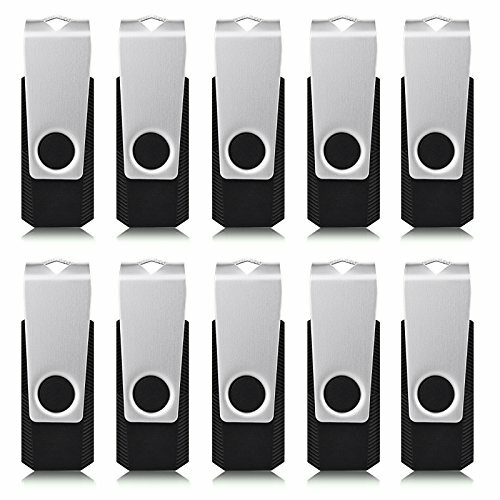 INCREDIBLE STORAGE -100 * 128MB USB Flash Drives, without any logo on it, you can print yours or customer's personal logo on it. Great for business use: digital data storing, transferring and sharing to clients. Apply to data storage of music, photos, movies, designs, manuals, programmes, handouts etc. SWIVEL DESIGN, tiny and classic style: the metal clip rotated 360°around the ABC plastic body, not only useful for adapting to special environment, but also provide efficiency protection of the internal chipset. SLEEK, CHIC, CONVINIENT AND ALSO USEFUL - The lightweight and portable usb sticks have a nice and sleek design. The end of the thumb drives has a loop for a lanyard or key ring to keep it safe or on your keys. GOOD AND PROFESSIONAL PACKAGE - They are packaged very securely in a heavy cardboard box with a foam insert and cutouts that has a spot carved out for each drive. Each memory stick drives with a little polythene cover on to make sure they stay in good condition and the end is protected by the metal part that swings over it. The packaging was so clean and neat, let you are confident giving these to your clients or friends.